Photographix produces high quality 4000dpi drum scans from your negatives, transparencies and flat art. Each transparency is individually analyzed and scan parameters manually adjusted for optimal sharpness, color balance and tonal range. Oversize or rigid flat art is scanned using our digital copy system, capable of producing a 340MB file at native resolution from any size artwork. In addition to producing the best scans possible from your originals, Photographix can provide optional scan preparation services, delivering final processed versions along with the raw scans saving you time and effort. 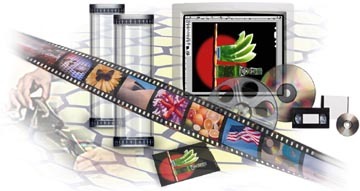 For example, we can color-correct, sharpen and enhance your images with digital effects, add paths or backgrounds, proof them on the web, then deliver multiple resolution images on CD-Rom produced to the exact specification and format required for different projects, all produced to your specifications.